London, July 10 2017 – In a new Mastercard study/, launched today, people from eleven European countries shared their views on why digital innovation and solutions are so important for the future of financial services, commerce and retail. 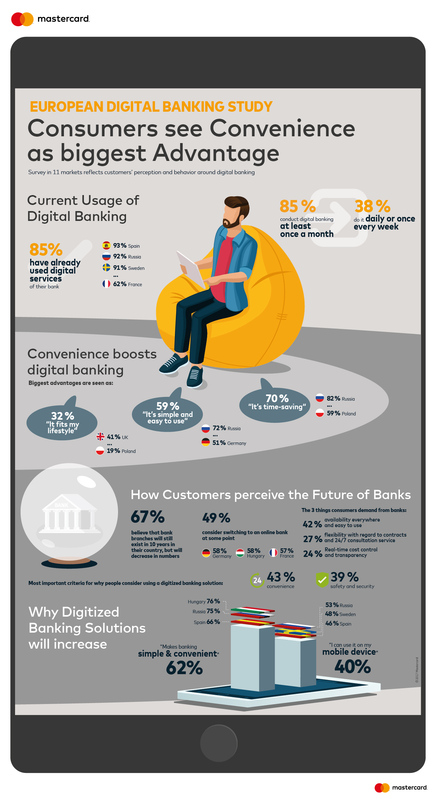 The study of European banking customers shows that convenience was the most significant advantage for digital banking solutions, with time-saving (70%) and ease of use (59%) being the key drivers. Six out of ten Europeans welcome digital solutions and believe that the digitization of the banking industry is making their lives easier and safer. Today, Mastercard is a key driver and partner in delivering digital solutions, working with over 30 new digitized banks across Europe including N26, Holvi and Monzo, and many more around the world. As the leading global payments technology company Mastercard is helping all partners develop customer-oriented, convenient and safe solutions for today and tomorrow. By providing technological know-how, a global infrastructure, products and a world-wide network to financial institutions, Mastercard is perfectly placed to support all banks and Fintechs, as whether new or established, all players are having to navigate the industry’s digital transformation. The study also demonstrates that customer loyalty towards their current bank is comparatively low: Nearly half of the consumers in Europe (49%) say they will consider switching to a digital bank at some point. Especially, in Germany consumers have little loyalty: 27% think of leaving their bank within the next 12 months. That is by far the highest rate in Europe whereas the Dutch are the most loyal. Only 7% state that they consider changing their bank and 52% want to stay. Furthermore, European consumers believe that the process of digitization in the financial industry will affect bank branches. Two thirds think that bank branches will still exist in ten years but decrease in numbers whereas only 6% are convinced that bank branches will have ceased to exist in ten years’ time. When asked what consumers would change within their current bank, if they could, their primary demand was “convenience”, wishing that their banks’ products were “available everywhere as well as easy to use” (42%). The second most common answer was flexibility and 24/7 consultation service (27%). More than 85% pursue banking digitally (online or mobile) at least once a month, and 38% even do it on a daily to weekly basis. The most active users are the British (54%), followed by the Dutch (51%) and the Swedes (47%), doing digital banking at a daily to weekly basis in contrast to only 26% of the Swiss and 27% of the Hungarians at the bottom of the surveyed markets. The process of digitization in the financial sector relies on partnerships, a result which is also endorsed by European consumers in the Digital Banking Study. More than 75% of the respondents in the study said they value Mastercard as a right partner for banks. One of Mastercard’s biggest partners in mobile banking is N26. Having started out in Germany, N26 is now in 17 markets and the leading mobile bank in Europe. “Everything we do is centered on a state-of-the-art user experience. Technology plays a vital role in achieving this goal”, says Valentin Stalf, co-founder and CEO of N26. “It was clearly a challenge to find partners who have the digital and therefore flexible infrastructure creating unique and simple user experiences. We recognized quite early that Mastercard is a dynamic player on the market, open for new products and technologies. Receiving these qualities from a renowned brand that keeps up with the newest developments, but also has a global network, is like hitting the jackpot. ” Mastercard provides N26 with issuing and processing solutions which are essential in order to offer the product to the customer. Beyond that, Mastercard consults N26 on technical solutions regarding payment services. As one of the pioneers in the field, N26 aims at digitizing all products and services traditional banks offer. Another example is Holvi, a company which offers digital banking to micro entrepreneurs. The Finnish company started out by solving the everyday problems of self-employed people with their finance management. Furthermore, these micro entrepreneurs often had difficulties to receive appropriate support from traditional banks. With the goal in mind to become the preferred financial management service for micro entrepreneurs and small businesses in Europe, Holvi helps their customers saving time, money and running their business more effectively. Since 2016, the Holvi Business Mastercard connects directly with their service and allows Holvi’s customers to stay on top of their finances in real time. “For us it is important to work with partners who stand for trustworthiness. Our mission is to provide borderless banking to our customers in the digital era – Mastercard does not know any borders and works worldwide, just like our customers,“ says Antti-Jussi Suominen, CEO at Holvi. Please click on the following links N26, Holvi and Monzo to read the full case studies. The study was conducted by Innofact AG and commissioned by Mastercard. 11.915 samples were taken from eleven European markets in: Italy (1084), Germany (1081), Spain (1081), France (1088), United Kingdom (1090), Poland (1082) Netherlands (1083), Sweden (1082), Switzerland (1088), Hungary (1076) and Russia (1080). The respondents were recruited by the Innofact online panel entscheiderclub.de and its international partner panels. The respondents are aged 18 years and above.